Toning is a vital step in your daily beauty care routine. It helps invigorate and rebalance skin after cleansing and maximises the benefits of your moisturiser. 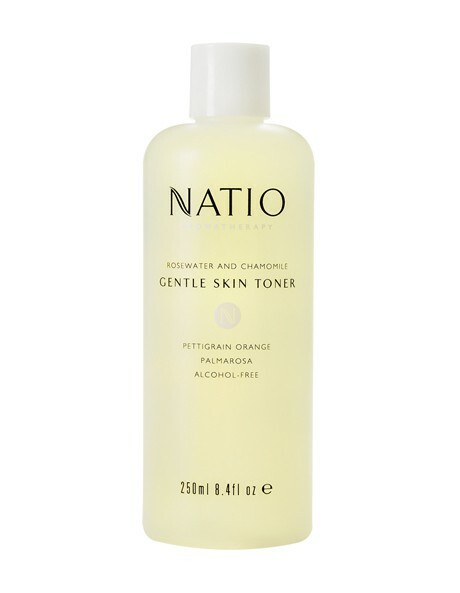 Natio's Rosewater and Chamomile Skin Toner leaves skin feeling balanced and refreshed, while the pure essential oils promote healthy, glowing skin. Water (Aqua), Glycerin, Chamomilla Recutita (Matricaria) Extract, Rose (Rosa Spp) Extract, Citrus Aurantium Dulcis (Orange) Oil, Cymbopogon Martini (Palmarosa) Oil, Citrus Aurantium Amara (Bitter Orange) Oil, Ceteth-20, Fragrance (Parfum), Phenoxyethanol, Methylparaben, Propylparaben, Tetrasodium EDTA, Citric Acid, Ethoxydiglycol, Propylene Glycol, Butylene Glycol, Glucose, Bisabolol.